From agricultural and ecological points of view, Lesotho can be divided up into four agro-ecological zones (Figure 1), namely, mountains (59% of Lesotho), foothills (15%), lowlands (17%) and the Senqu River Valley (9%) (CIAT and World Bank 2018; FAO 2005). The majority of the agriculture sector in Lesotho consists of pastoral farming (livestock) and only about 9% of Lesotho’s land is suitable for arable farming (growing crops) (Mekbib et al. 2017; FAO 2005; Gwimbi et al. 2013). 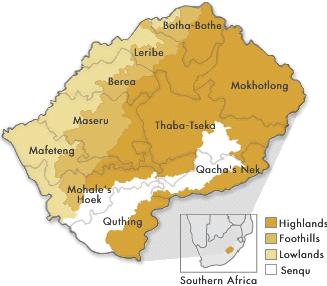 Most of Lesotho’s arable land is in the lowlands, with some also occurring in the foothills and the Senqu River Valley regions (Mekbib et al. 2017; FAO 2005). The lowlands and foothills regions are also where population densities are highest, which has led to arable land having been lost through expanding human settlements (Mekbib et al. 2017; Ministry of Local Government and Chieftainship Affairs 2015; Gwimbi et al. 2014). Most of Lesotho (about 60%) consists of high-altitude rangelands mostly found in the mountains and foothills agro-ecological zones (Mekbib et al. 2017). In Lesotho, rangelands consist of grasslands that are principally used for extensive (low resource input) pastoral farming (grazing), especially for the rearing of sheep, goats and cattle (Mekbib et al. 2017; CIAT and World Bank 2018; Dejene et al. 2011; Department of Range Resources Management 2014). The general condition of these rangelands is poor and in decline due to overstocking, overgrazing, poor land management, soil erosion and the spread of invasive alien and invasive indigenous plants (Gwimbi et al. 2013; Hae 2016). Is is predicted that climate change will exacerbate soil erosion, increase the ranges and growth rates of some invasive alien species, further increase the degradation of rangelands, lower livestock productivity and reduce the carrying capacities of the rangelands (Gwimbi et al. 2013; CIAT and World Bank 2018; Gwimbi et al. 2014; Dejene et al. 2011). Additionally, overstocking decreases the nutrition available in the grasses thereby further reducing livestock productivity, numbers and quality as well as reducing carrying capacities (Gwimbi et al. 2013). Given the limited areas in Lesotho that are suitable for arable farming, the country relies heavily on food imports, most of which come from South Africa (Ministry of Local Government and Chieftainship Affairs 2015; World Bank 2016; FAO 2005). As an example, domestic production of cereal crops (such as maize) in Lesotho is only enough to satisfy about 30% of the demand in Lesotho. The remaining 70% has to be imported, thus leaving Lesotho is a perpetual state of food insecurity(CIAT and World Bank 2018; Ministry of Local Government and Chieftainship Affairs 2015; The Kingdom of Lesotho and FAO 2012). Lesotho has endured food insecurity for many years and it is estimated that about 30% of people living in Lesotho are vulnerable to food insecurity (CIAT and World Bank 2018; Mekbib et al. 2017; World Bank 2016; Gwimbi et al. 2013). This food insecurity has been exacerbated by periodic droughts and floods, soil erosion and soil loss, low soil fertility, land degradation (from overstocking, overgrazing and overharvesting), the use of low-yielding crop varieties and desertification (CIAT and World Bank 2018; Mekbib et al. 2017; Gwimbi et al. 2013; Lesotho Meteorological Services 2017; Ministry of Local Government and Chieftainship Affairs 2015; The Kingdom of Lesotho and FAO 2012). Soil erosion and soil loss are widespread in Lesotho and have severely reduced the productive capacity of agricultural land in Lesotho (Dejene et al. 2011; Mekbib et al. 2017). Furthermore, it is estimated that Lesotho is losing about 2% (or about 40 million tons) of its topsoil every year from wind and rainfall exacerbating the issues described above (Mekbib et al. 2017; Lesotho Meteorological Services 2007). As was found in a study in Lesotho, some people indicated how they might take their children out of school in drought years, using the school fee money to feed the family. While keeping the family alive, this can have detrimental effects in that without education children are less likely to get out of the poverty trap. Approximately 72% of Lesotho’s population live in rural areas and the vast majority of these people rely on subsistence agriculture (Ministry of Local Government and Chieftainship Affairs 2015). While approximately 80% of Lesotho’s population rely on farming for their livelihoods, the agriculture sector contributes a relatively small amount (between 6% and 10%) to Lesotho’s gross domestic product (CIAT and World Bank 2018; Mekbib et al. 2017; Gwimbi et al. 2013; Lesotho Meteorological Services 2017; Irish Aid 2015). In spite of this relatively small contribution to Lesotho’s economy, approximately 41% of people in Lesotho are employed in the agriculture sector, however, the number of jobs in the agriculture sector is declining partially due to decreasing production and fewer hectares under cultivation (CIAT and World Bank 2018; Gwimbi et al. 2013). Fewer hectares are under production in Lesotho than used to be because of the loss of soil, land degradation, climate variability, lack of input (e.g. fertilisers) and seasonal climatic variability (e.g. late rains and early frosts) as 99% of agriculture in Lesotho is rainfed (Gwimbi et al. 2013). All of these factors have contributed to notable seasonal food insecurity (Gwimbi et al. 2013). In Lesotho, the most important crops are maize, sorghum (which is more drought resistant than maize), wheat, beans and peas (Gwimbi et al. 2014, 2013). Other notable crops include potatoes and vegetables and fruit (Gwimbi et al. 2014, 2013). While vegetables and fruit are grown mostly on a subsistence scale, growing fruit commercially for export, especially deciduous fruit like apples and peaches (which in Lesotho ripen early in the season) is a government focus area (Morgan-Jarvis 2018; Mpaki 2018; World Bank 2018; Lesotho Bureau of Statistics 2015b). Maize is the dominant crop grown in Lesotho, accounting for an estimated 60% of all arable areas being cropped (Gwimbi et al. 2014). It is estimated that only 1% of the crops grown in Lesotho are grown under irrigation and the vast majority of smallholder and subsistence farming is rainfed (Dejene et al. 2011; World Bank 2016). The primary livestock farmed in Lesotho are sheep (wool and meat), goats (mohair and meat) and cattle (for ploughing, milk, meat and their dung for fuel); while poultry, pigs, horses and donkeys are also farmed for food, transport and/or ploughing (CIAT and World Bank 2018; Mekbib et al. 2017; Lesotho Bureau of Statistics 2015c, 2015d). Livestock are also socially and culturally important, for example, as sacrifices (Gwimbi et al. 2013). A summary of agriculture production per agro-ecological zones is given in Table 1. 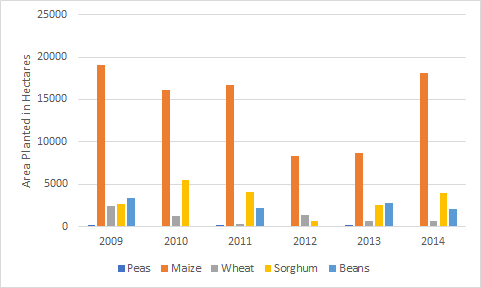 Other crops that have some potential to be grown in Lesotho include groundnuts (also known as peanuts) (Figure 2), soybeans (Figure 3) and sunflowers (Figure 4) (Schulze and Maharaj 2007c, 2007g, 2007h). 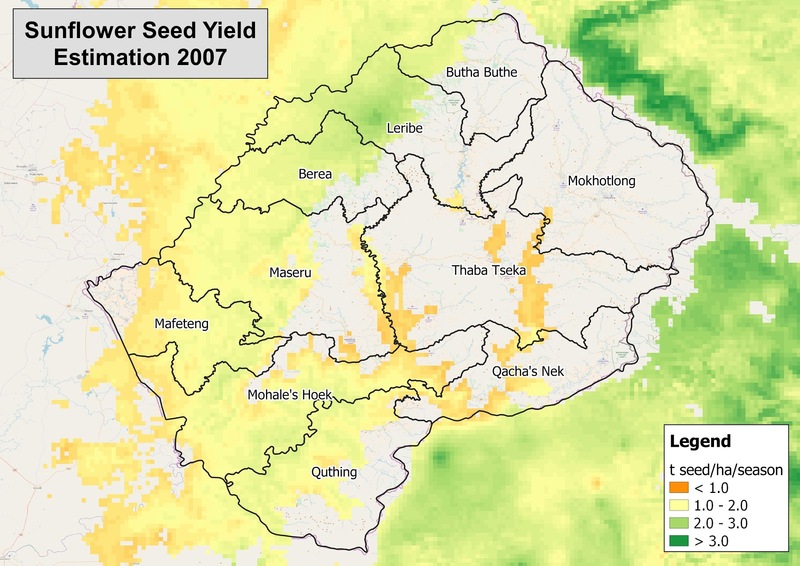 It is apparent from Figure 2, Figure 3 and Figure 4 that the eastern half of Lesotho has the areas with potential for growing groundnuts, soybeans and sunflower are in the east of the country, although the yield for these three crops, in tons per hectare per season (t/ha/season) are generally on the lower end of the scale (Schulze and Maharaj 2007c, 2007g, 2007h). Furthermore, aquaculture (freshwater fisheries) is a growing part of Lesotho’s agriculture sector (Morgan-Jarvis 2018). Fish are primarily being farmed in Lesotho’s Katse Dam and the main fish species being farmed is Rainbow trout (Oncorhynchus Mykiss) (Morgan-Jarvis 2018). Rainbow trout is eaten locally and exported, most notably to Japan (Morgan-Jarvis 2018). In 2016, approximately 800 tons of trout was harvested in Lesotho (Morgan-Jarvis 2018). Additionally, some commercial forests consisting of Pinus and Eucalyptus species occur in Lesotho (Lesotho Meteorological Services 2007). Areas that are climatically suitable for growing three species of gum trees (Eucalyptus grandis, Eucalyptus nitens and Eucalyptus GxN) are shown in Figure 5, Figure 6 and Figure 7 (Schulze and Maharaj 2007b, 2007a). Furthermore, the potential (estimated) yields of three species of pine trees (Pinus elliottii, Pinus patula and Pinus taeda) are shown in Figure 8, Figure 9 and Figure 10 (Schulze and Maharaj 2007d, 2007e, 2007f). 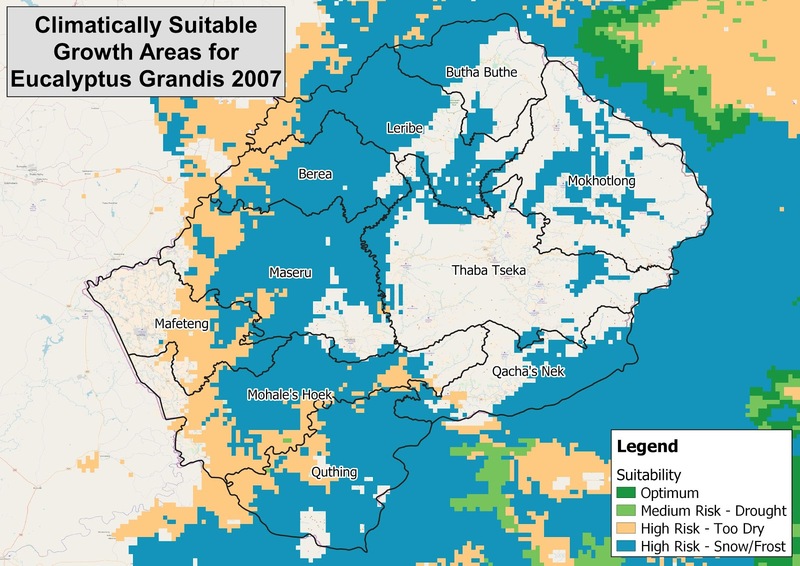 Figure 5 shows that there are no areas within Lesotho that are optimal for growing Eucalyptus Grandis, however, most of the country that is not unsuitable (unsuitable areas are shown in white) has a medium risk for successfully growing Eucalyptus Grandis due to snow and frost (Schulze and Maharaj 2007b). 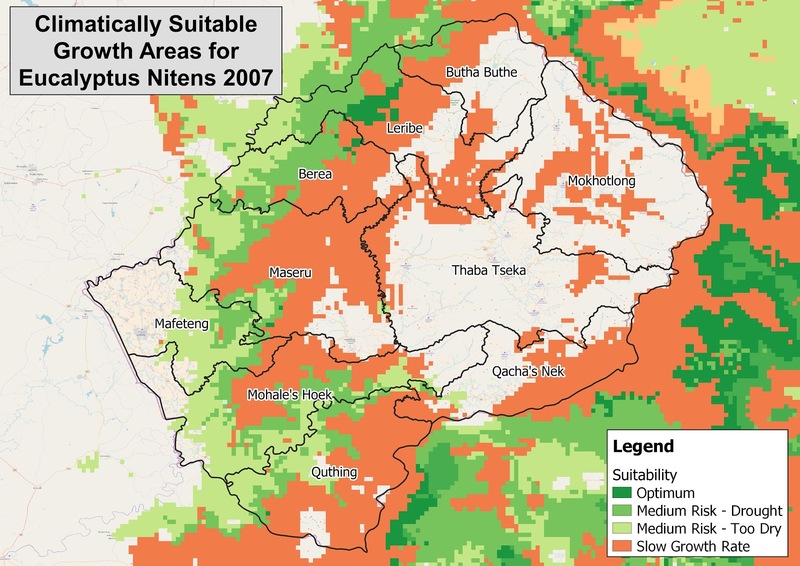 Figure 6 and Figure 7 show that in northern Lesotho there are small areas where Eucalyptus nitens and Eucalyptus GxN can be optimally grown (Schulze and Maharaj 2007a). However, for growing these two species in Lesotho, host of the country is either unsuitable or has drought or cold related risks (Schulze and Maharaj 2007a). All three species of pine trees have low estimated potential yields – shown as tons per hectare (t/ha) in Figure 8, Figure 9 and Figure 10 (Schulze and Maharaj 2007d, 2007e, 2007f). Pinus elliottii and Pinus taeda (Figure 8 and Figure 10) have the climatic potential to be grown in certain parts of eastern and southern Lesotho, while Pinus patula has the potential (climatically) to be grown over a much larger part of Lesotho (Figure 9) (Schulze and Maharaj 2007d, 2007e, 2007f). Only 1.5% of Lesotho is covered by forests as Lesotho has experienced extensive deforestation as well as forest degradation as wood is used as a primary source of energy for heating and cooking (CIAT and World Bank 2018; Dejene et al. 2011; Mekbib et al. 2017). The use of wood as a source of energy is particularly high in the mountainous regions of Lesotho compared to the lowlands where cow dung, paraffin and gas are also used (Dejene et al. 2011). One other crop that could be lucrative for Lesotho in the near future is cannabis (also known as marijuana, dagga, etc.) grown for medicinal uses, although stringent regulation will apply (Hedley 2018; Hall 2017). Medical cannabis was legalised in Lesotho in 2017 and at least one licensed grower and supplier operation is already underway in the country (Hedley 2018). It is thought that Lesotho has ideal cannabis growing conditions and this crop could become a lucrative export opportunity (Hedley 2018; Hall 2017). The agriculture sector in Lesotho is highly climate-sensitive and is vulnerable to climate change and climate variability (CIAT and World Bank 2018; Gwimbi et al. 2014, 2013; Lesotho Meteorological Services 2017). Climate change is forecast to increase climate change-related risks (e.g. 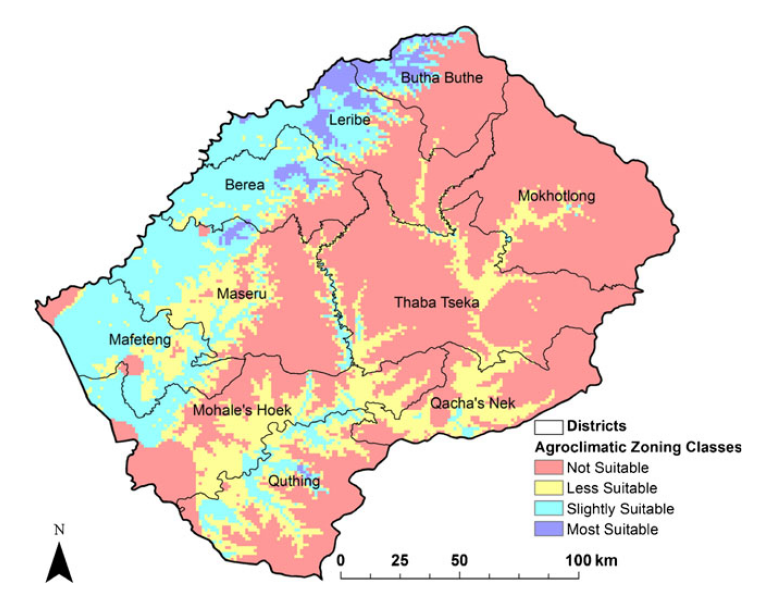 rainfall variability) more in the southern lowlands, the Senqu River Valley and the mountains agro-ecological zones than elsewhere in Lesotho (Gwimbi et al. 2013). Climate change is predicted to increase temperatures and slightly decrease total rainfall in Lesotho (Gwimbi et al. 2014; World Bank 2016), although some small increases in rainfall in the eastern parts of the country may occur (Mekbib et al. 2017; CIAT and World Bank 2018). These changes are predicted to affect the agriculture sector both positively and negatively. Furthermore, rainfall variability is also predicted to increase both temporally (i.e. over time, for example, seasonal changes) and spatially (some areas will get more rain than others) (Mekbib et al. 2017; World Bank 2016). This increase in rainfall variability is predicted to lead to decreases in water and food security as most crop-based agriculture in Lesotho is rainfed rather than irrigated (CIAT and World Bank 2018; World Bank 2016). Furthermore, rainfall variability may also lead to increased flooding in parts of Lesotho, which would negatively impact the agriculture sector (CIAT and World Bank 2018). However, the predicted increases in average temperatures may increase the yields of some cereals (e.g. maize) in parts of Lesotho that are currently frost prone (CIAT and World Bank 2018). Additionally, the length of the growing season will likely lengthen, and the diversity of crops could increase (Dejene et al. 2011; CIAT and World Bank 2018; World Bank 2018). However, while about 9% of Lesotho land is currently suitable for arable farming, this could be reduced to only 3% due to climate change (Lesotho Meteorological Services 2007). While increased average temperatures may help crops, livestock and people, they will likely lead to decreased snowfall and snowmelt, less soil moisture, increased evaporation, increased pressure from agricultural pests and diseases, increased growth of invasive alien species, and more frequent and severe extreme weather events (Dejene et al. 2011; Gwimbi et al. 2013; CIAT and World Bank 2018; Lewis and Oosthuizen 2014). For example, the production of fruit (such as apples and pears), while a small but growing part of the agriculture sector in Lesotho, could become vulnerable to damage from a predicted expansion of the areas affected by agricultural pests such as codling moths and oriental fruit moths (DEA 2013). It is, however, predicted that these climate change impacts will outweigh the benefits from warmer average temperatures (CIAT and World Bank 2018; Mekbib et al. 2017). These climate change impacts will also negatively affect Lesotho’s natural resources, water resources, agricultural productivity and food security (Dejene et al. 2011). In all likelihood, climate change will increase Lesotho’s already high dependence on agricultural imports (CIAT and World Bank 2018). Climate change may even affect the financial viability of commercial farms due to predicted increases in the frequency and intensity of climate-related hazards (Dejene et al. 2011; CIAT and World Bank 2018). …the potential magnitude of future climate-related hazards may exceed the adaptive capacity of rural communities, especially given their current conditions of marginalisation. In crop farming in Lesotho, maize is the most widely grown crop in Lesotho (Gwimbi et al. 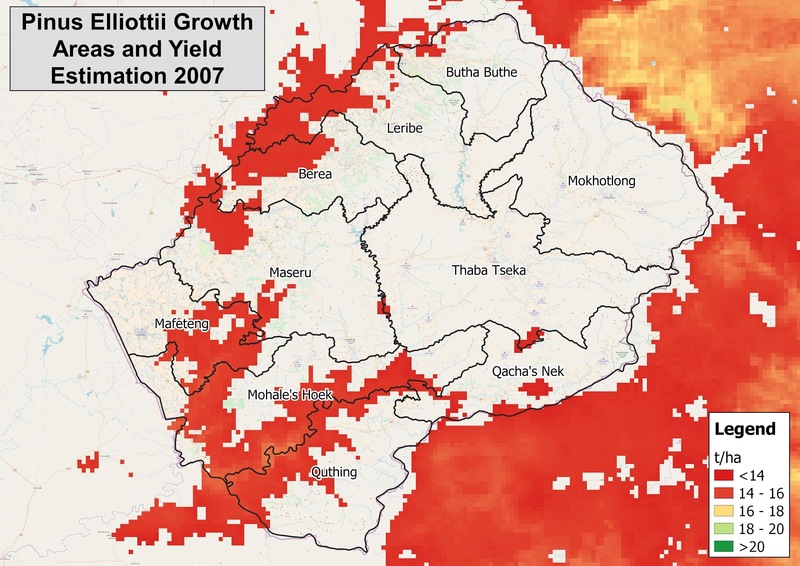 2014), however, areas that are ‘most suitable’ to growing maize in dryland conditions (rainfed maize) are limited to some areas in the north-west of Lesotho (Figure 11) (Moeletsi and Walker 2013). The suitability of areas in Figure 11 is based on temperature, frost, slope (level of steepness/flatness) and rainfall into consideration (Moeletsi and Walker 2013). In the Mohale’s Hoek District, the majority of the area is either ‘not suitable’ or ‘less suitable’ for growing rainfed maize (Moeletsi and Walker 2013). More so that crop farming, livestock farming is important to the agriculture sector in the Mohale’s Hoek District. According to Lesotho’s Annual Agricultural Production Survey for the 2013/2014 Agricultural Year, an estimated 10% of cattle farmed in Lesotho, were farmed in the Mohale’s Hoek District (Lesotho Bureau of Statistics 2015c). However, in the same agricultural year, farmers in the Mohale’s Hoek District produced an estimated 37% of all milk produced in Lesotho (Lesotho Bureau of Statistics 2015d). For the 2013/2014 Agricultural Year, an estimated 8% of Lesotho’s sheep and 12% of Lesotho’s goats were farmed in the Mohale’s Hoek District (Lesotho Bureau of Statistics 2015c). Additionally, in the 2013/2014 Marketing Year, an estimated 7 % of Lesotho’s wool and 13% of Lesotho’s mohair was produced in the Mohale’s Hoek District (Lesotho Bureau of Statistics 2015d). In the 2013/2014 Marketing Year, the Mohale’s Hoek District also accounted for an estimated 11% of Lesotho’s slaughtered cows; 11% of Lesotho’s slaughtered sheep; 18 % of Lesotho’s slaughtered goats; and 7% of Lesotho’s slaughtered pigs (Lesotho Bureau of Statistics 2015d). CIAT, and World Bank. 2018. “Climate-Smart Agriculture in Lesotho.” Washington, D.C., USA: World Bank. http://documents.worldbank.org/curated/en/866541527750717859/Climate-smart-agriculture-in-Lesotho. DEA. 2013. “Long Term Adaptation Scenarios, Phase 1 – Technical Report – No 3 of 6 – Agriculture And Forestry Sectors In South Africa.” https://drive.google.com/file/d/0B88z-WjOEKIlbkU0UnZkZHBMNEk/. Dejene, Alemneh, Stephanie Midgley, Makoala V. Marake, and Selvaraju Ramasamy. 2011. Strengthening Capacity for Climate Change Adaptation in Agriculture: Experience and Lessons from Lesotho. Environment And Natural Resources Management Series 18. Rome: Food and Agriculture Organization of the United Nations. http://www.fao.org/3/a-i2228e.pdf. Department of Range Resources Management. 2014. “National Range Resources Management Policy.” Maseru, Lesotho: Lesotho Minister of Forestry and Land Reclamation. https://www.giz.de/en/downloads/giz2014-en-national-range-resource-management-policy-lesotho.pdf. FAO. 2005. “Irrigation in Africa in Figures – AQUASTAT Survey 2005 – Lesotho.” http://www.fao.org/nr/water/aquastat/countries_regions/LSO/LSO-CP_eng.pdf. Gwimbi, Patrick, Puseletso Likoetla, Kanono Thabane, and Puleng Matebesi. 2014. “A Comprehensive Scoping and Assessment Study of Climate Smart Agriculture (CSA) Policies in Lesotho.” https://www.fanrpan.org/archive/documents/d01756/Lesotho_Comprehensive_Scoping_Assessment_of_CSA_Policies.pdf. Gwimbi, Patrick, Timothy S. Thomas, Sepo Hachigonta, and Lindiwe Majele Sibanda, eds. 2013. “Chapter 4 – Lesotho.” In Southern African Agriculture and Climate Change: A Comprehensive Analysis. Washington, DC: International Food Policy Research Institute. http://dx.doi.org/10.2499/9780896292086. Hae, Malipholo. 2016. “Invasive Plant Species in Lesotho’s Rangelands: Species Characterization and Potential Control Measures.” Reykjavik, Iceland: Land Restoration Training Programme, United Nations University. http://www.unulrt.is/static/fellows/document/hae2016.pdf. Hall, James. 2017. “Lesotho Gives SA Firm Dagga Licence.” Cape Times, October 11, 2017, sec. Opinion. https://www.iol.co.za/capetimes/opinion/lesotho-gives-sa-firm-dagga-licence-11551877. Hedley, Nick. 2018. “High Demand for Stake in Dagga Shares.” Business Day, August 30, 2018, sec. Companies. https://www.businesslive.co.za/bd/companies/2018-08-30-high-demand-for-stake-in-dagga-shares/. Irish Aid. 2015. “Lesotho Climate Action Report.” https://www.irishaid.ie/media/irishaidpublications/Country-Climate-Action-Reports-Lesotho-FINAL.pdf. Johnston, P.A., H.J. Oosthuizen, R.E. Schulze, O. Crespo, D.B. Louw, M.A. Tadross, K. Waagsaether, and S. Arowolo. 2016. “Modelling Impacts of Climate Change on Selected South African Crop Farming Systems.” Research Report 1882/1/16. Pretoria, South Africa: Water Research Commission. http://www.wrc.org.za/Pages/DisplayItem.aspx?ItemID=11838. Lesotho Bureau of Statistics. 2015a. “2013/2014 Agricultural Production Survey Crops.” Statistical Report 6. Maseru, Lesotho: Lesotho Bureau of Statistics. http://www.bos.gov.ls/New%20folder/Copy%20of%20Agriculture/2013-2014_Agricultural_Production_Survey.zip. ———. 2015b. “2014 Biodiversity and Land Use.” Statistical Report 15. Maseru, Lesotho: Lesotho Bureau of Statistics. http://www.bos.gov.ls/New%20Folder/Environment%20and%20Energy/2014_Land_use_and_Biodiversity.zip. ———. 2015c. “Lesotho Livestock Statistical Report 2013/2014.” Statistical Report 8. Maseru, Lesotho: Lesotho Bureau of Statistics. http://www.bos.gov.ls/New%20Folder/Copy%20of%20Agriculture/2013_14_Livestock_Report.zip. ———. 2015d. “Livestock Products Report 2013/2014.” Statistical Report 21. Maseru, Lesotho: Lesotho Bureau of Statistics. http://www.bos.gov.ls/New%20Folder/Copy%20of%20Agriculture/2013_14_Livestock_Products.zip. Lesotho Meteorological Services. 2007. “Lesotho’s National Adaptation Programme of Action (NAPA) on Climate Change.” https://unfccc.int/resource/docs/napa/lso01.pdf. ———. 2017. “Lesotho’s National Climate Change Policy 2017 – 2027.” Lesotho: Ministry of Energy and Meteorology. http://www.gov.ls/gov_webportal/important%20documents/National%20Climate%20Change%20Policy%202017-%202027.pdf. Lewis, F., and S. Oosthuizen, eds. 2014. “Adapting to a Changing Climate – Integrating Ecosystem and Community Based Adaptation for a Resilient Future: A Study in the Highlands of Lesotho.” Institute of Natural Resources NPC. http://inr.org.za/wp-content/uploads/2018/05/Adapting-to-a-Changing-Climate-Booklet.pdf. Mekbib, S.B., A.O. Olaleye, M. Johane, and T. Wondimu. 2017. “Chapter 8 – Indigenous Knowledge to Address the Challenges of Climate Change: Case of Machobane Farming System in Lesotho.” In Indigenous Knowledge Systems And Climate Change Management In Africa, 316. Wageningen, The Netherlands: The Technical Centre for Agricultural and Rural Cooperation. https://publications.cta.int/media/publications/downloads/2009_PDF.pdf. Ministry of Local Government and Chieftainship Affairs. 2015. “The Kingdom of Lesotho: Habitat III National Report 2015.” http://habitat3.org/wp-content/uploads/Lesotho-Habitat-III-Report-08-June-2015.pdf. Moeletsi, Mokhele, and Sue Walker. 2013. “Agroclimatological Suitability Mapping for Dryland Maize Production in Lesotho.” Theoretical and Applied Climatology 114 (October). https://doi.org/10.1007/s00704-012-0829-1. Morgan-Jarvis, Louella, ed. 2018. “Agriculture.” In Lesotho Review – An Overview of the Kingdom of Lesotho’s Economy – 2018 Edition, 2018th ed. Umdloti Beach, KZN, South Africa: Wade Publications. http://www.lesothoreview.com/digital-edition/. Mpaki, Bereng. 2018. “Govt Eyes Massive Fruit Production.” Lesotho Times. March 24, 2018. http://www.lestimes.com/govt-eyes-massive-fruit-production/. Schulze, R.E., and M. Maharaj. 2007a. “Climatically Suitable Growth Areas for Other Eucalyptus Species and Hybrids.” In South African Atlas of Climatology and Agrohydrology. Vol. 1489/1/06. Pretoria, South Africa: Water Research Commission. http://sarva2.dirisa.org/resources/documents/beeh/Section%2018.4%20Suit%20Areas%20Eucal_update.pdf. ———. 2007b. “Eucalyptus Grandis Growth Areas and Yield Estimation.” In South African Atlas of Climatology and Agrohydrology. Vol. 1489/1/06. Pretoria, South Africa: Water Research Commission. http://sarva2.dirisa.org/resources/documents/beeh/Section%2018.3%20Eucalyptus%20grandis.pdf. ———. 2007c. 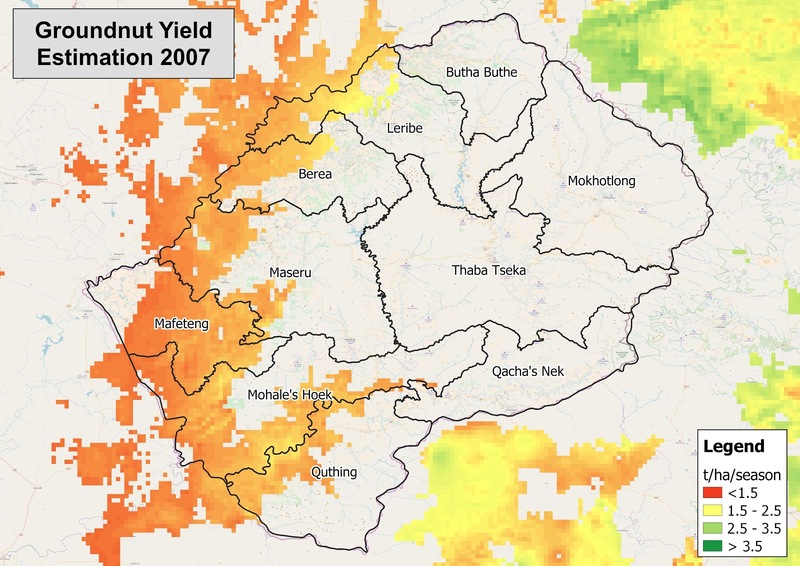 “Groundnut Yield Estimation.” In South African Atlas of Climatology and Agrohydrology. Vol. 1489/1/06. Pretoria, South Africa: Water Research Commission. http://www.sasdi.net/metaview.aspx?uuid=d4e318e1d2aa19a7c4b71d6205f22e99. ———. 2007d. “Pinus Elliottii Growth Areas and Yield Estimation.” In South African Atlas of Climatology and Agrohydrology. Vol. 1489/1/06. Pretoria, South Africa: Water Research Commission. http://sarva2.dirisa.org/resources/documents/beeh/Section%2018.6%20Pinus%20elliottii.pdf. ———. 2007e. “Pinus Patula Growth Areas and Yield Estimation.” In South African Atlas of Climatology and Agrohydrology. Vol. 1489/1/06. Pretoria, South Africa: Water Research Commission. http://sarva2.dirisa.org/resources/documents/beeh/Section%2018.7%20Pinus%20patula.pdf. ———. 2007f. 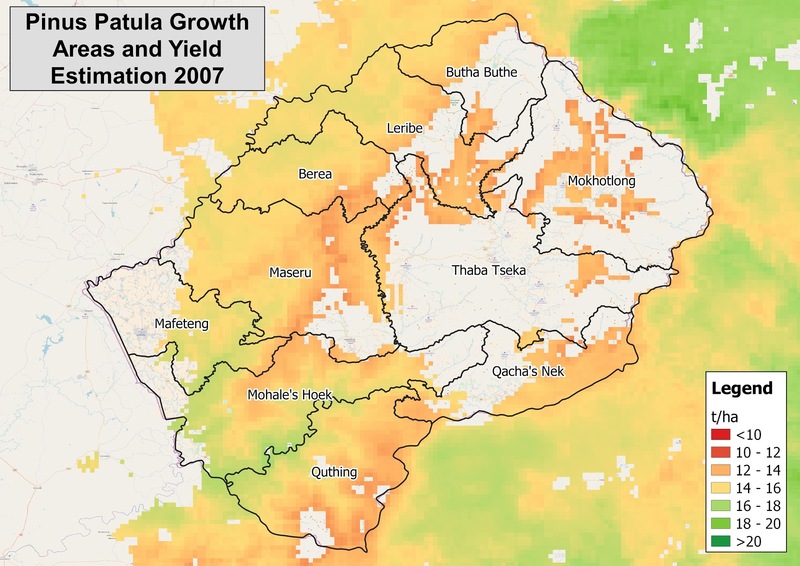 “Pinus Taeda Growth Areas and Yield Estimation.” In South African Atlas of Climatology and Agrohydrology. Vol. 1489/1/06. Pretoria, South Africa: Water Research Commission. http://sarva2.dirisa.org/resources/documents/beeh/Section%2018.8%20Pinus%20taeda.pdf. ———. 2007g. 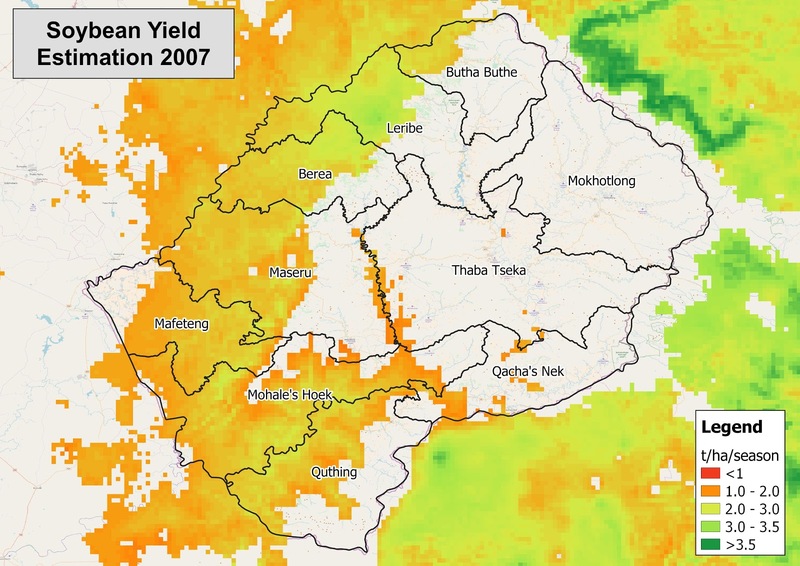 “Soybean Yield Estimation.” In South African Atlas of Climatology and Agrohydrology. Vol. 1489/1/06. Pretoria, South Africa: Water Research Commission. http://www.sasdi.net/metaview.aspx?uuid=235585ea1dcc01290a468ae7c465551d. ———. 2007h. 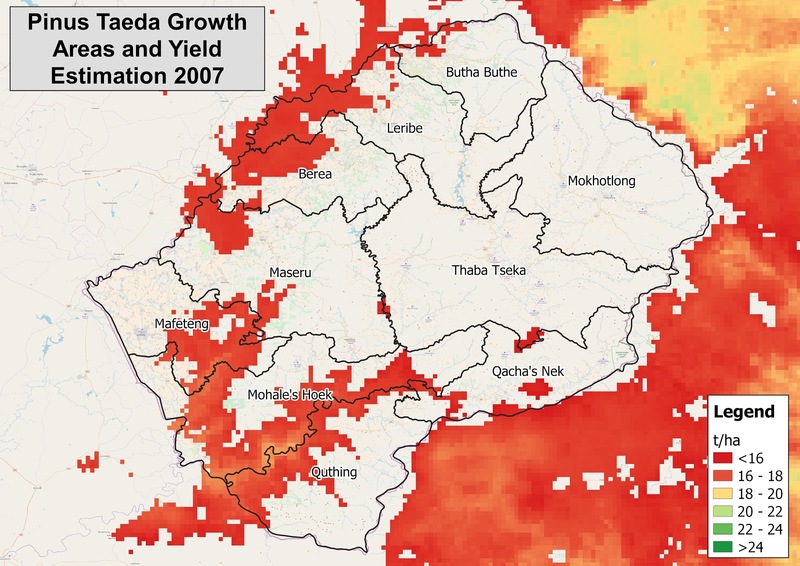 “Sunflower Seed Yield Estimation.” In South African Atlas of Climatology and Agrohydrology. Vol. 1489/1/06. Pretoria, South Africa: Water Research Commission. http://www.sasdi.net/metaview.aspx?uuid=730c61e2ba87a7cfc7ebc459fe74e4f7. The Kingdom of Lesotho, and FAO. 2012. “Lesotho Country Programming Framework 2013 – 2017.” http://www.fao.org/3/a-bp623e.pdf. World Bank. 2016. “Lesotho Water Security and Climate Change Assessment.” Washington, D.C., USA: World Bank. http://documents.worldbank.org/curated/en/446521472206603986/Lesotho-water-security-and-climate-change-assessment. ———. 2018. “Private Sector Competitiveness and Economic Diversification Project (P144933) – Implementation and Results Report.” http://documents.worldbank.org/curated/en/613591525822062704/pdf/Disclosable-Version-of-the-ISR-Second-Private-Sector-Competitiveness-and-Economic-Diversification-Prj-P144933-Sequence-No-10.pdf.